Take the Kindle, for example. This is Amazon’s real masterpiece, a modified Android locked down to the Amazon ecosystem and designed to showcase Amazon items. Just about every book you can think of is produced in Amazon format, meaning that you don’t have to agonize over which books to pack in your suitcase. If you want, you can take the entire library with you when you travel. Even if you don’t have the ability to access Wi-Fi where you’re going, all of the books you have stored on the device already will still be there. While some people lament that e-readers and tablets are limited by the small screens, we would argue that this is exactly why e-readers are awesome. Instead of carrying around a big screen in order to read important papers and books, you have a device that’s convenient to hold. We could spend hours reading with our Kindles, where regular books would soon cause eyestrain and heavy fatigue. Falling asleep with a good book is certainly not a bad thing, but the portability of the e-reader can’t be overlooked. There are of course, some things left to be desired still. Color ink e-readers haven’t made waves yet, leaving us with black and white interfaces. Since it’s been nearly 10 years since the first e-reader came out, it’s hard to understand why we don’t have something so basic as a color display yet. In tablets, we’re covered. 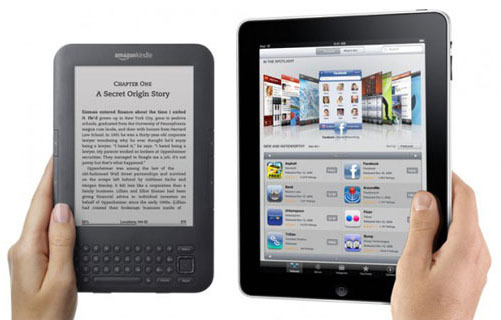 But e-readers are designed to stand out from tablets, and color displays would really set it off. If you have an e-reader, tell us: why do you like it? If you don’t have one yet, why is that? Sound off in the comments, we’d love to hear from you!